The new USGCC and USGM fuseholders are equipped with industry-proven and patented CAGE CLAMP® technology. This screw-less, spring pressure, wire termination technology has over 25 years of field experience and acceptance and can reduce wire installation time and cost by up to 75%. The spring terminal technology significantly improves system reliability by maintaining a very low contact resistance, easily withstanding corrosion, vibration and temperature cycling. The technology also eliminates the need for routine torque maintenance required by standard screw-type terminations. Mersen is the first manufacturer to offer this technology in a power fuseholder. 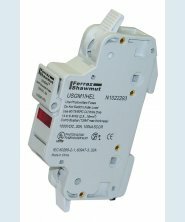 Mersen USGCC and USGM fuseholders feature IP20 finger-safe protection, a compact footprint, DIN-rail mounting and quick, easy and tool free fuse change-outs. The fuseholders are available and designed for use with class CC, midget and photovoltaic fuses at ratings up to 32A and 750VAC / 1000VDC. Fuseholders are also tested and certified by global standards organizations Underwriters Laboratories (UL), Canadian Standards Association (CSA) and International Electroctechnical Commission (IEC). Mersen's new USGCC & USGM series fuseholders deliver the ultimate ease-of-use, time (labor) saving and reliable solution available in the marketplace. Mersen is the first manufacturer to offer screw-less, spring pressure, wire termination technology into a power fuseholder, delivering the best of both technologies to its customers. These revolutionary fuseholders now allow you to experience the benefit of safety, ease-of-use, labor savings and spring pressure technology.